It’s me, and if I’m warning you that this will be long, well. So, first: The Sun Sword has been reis­sued in trade paper­back (which is the larger, non-stan­dard-size paper­back format). Yes, this means they are more expen­sive, sorry =/. This happened in July, but I didn’t find out about it until the end of August. I’ve added the rele­vant infor­ma­tion to the book pages here. I am not, as will become imme­di­ately obvious, much of a photog­ra­pher >.<. As you can see, there’s been some changes to the cover crop­ping and type. I’ve put my refer­ence copy of Shining Court beside the new version (which has reflected light on it that I only notice now T_T) to give you a sense of the size differ­ence. Below is a page spread from the trade paper­back of Broken Crown. 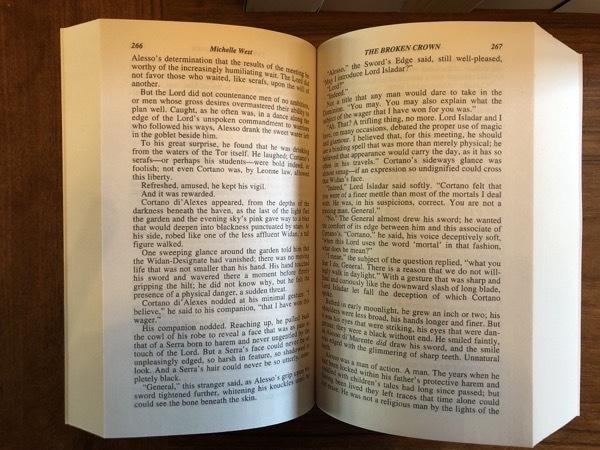 The books have not been re-typeset — it’s the same page layout as the mass market orig­inal, blown up in size. They are all avail­able now. Next up: It’s offi­cial. Mira has bought two Severn novels. Neither of which are written yet. These novels started as a novella, long over-due to the person who donated to a charity to be allowed to give me a short story prompt. >.<. In my defense, I did refuse to commit to a length — but I believe I also said it wouldn’t be a novel. Tech­ni­cally this is sort of true. It’s early Severn, and the Wolves. I can’t really say more than that at this point, in part because the first seven chap­ters did not go quite the way I thought they would (which is why this is novel(s) and not “novella”. I spent a few years doing nothing but revi­sions, subjec­tively speaking. In the real world, it was a couple of months. First, First­born. It has more words in it than it did when I first split the book, and it was not as straight­for­ward as any other split in my DAW career (of which there have been many), because I wrote the book knowing I couldn’t split it; War was supposed to be the final volume. But then at 430k, we had a book that couldn’t be bound. So. I chose the only emotional point from which the end of a novel could natu­rally arise and then… had to restruc­ture things to give that ending the impact it deserved. In the end I chose to open up some­thing that seemed obvious to me, if off-the-page, from the end of the entire 430k monster. My alpha reader told me that this was not obvious at all in the former iter­a­tion. This is a problem I often have; things that are not obvious seem obvious to me, because I know how they work. Things that are obvious to others seem more diffi­cult to me because I can’t always see forest for trees. Exam­ples of both abound >.<. War, however, now started in the middle of a book. The middle of a book is not a great place to begin a book. So the revi­sion on War was both neces­sary and front-loaded. I think, in the end, First­born is actu­ally a bit longer than War. Both are now with DAW, and I will not see them again until page proofs arrive, which in the case of the former, should be any minute now. But, they were done, and sent to Sheila! Yay! 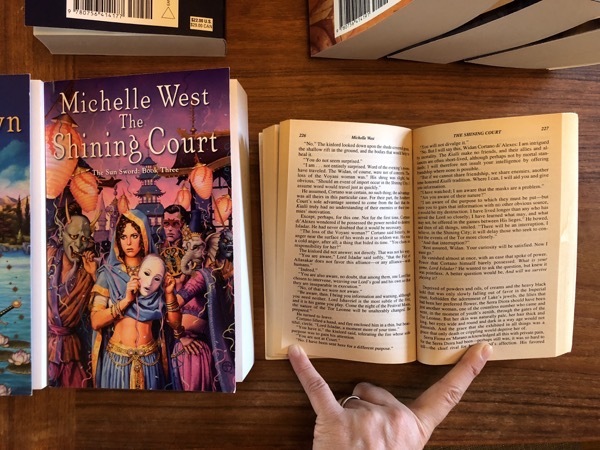 I sat down and started the first book of the last arc — which, for a West novel, means iter­a­tive approaches to the begin­ning of a book. This did not last two days. The universe decided I had not actu­ally done enough revi­sion; there was clearly not enough revi­sion in my life. Cast in Oblivion came back from my Mira editor, and so: Revi­sions! Again! By the end of those revi­sions I had reached an impor­tant conclu­sion: do not revise three books in a row. Revi­sions on one book — and I’ve only ever had one, with actual writing breaks in between — are fine. It’s bumpy in that I approach a book looking only for things that don’t work — things that I messed up, things I knew in my head that never quite made it to the page — but it’s posi­tive in that I can make it better. Three months of seeing nothing but the things I got wrong? Even the joy of fixing things or adding things is so heavily shad­owed by the fact that I wouldn’t need to do this if I could just get it right the first time. And that myth­ical ‘get it right the first time’… never happens. There are always things I miss. I know no authors person­ally who can claim that they never revise. There might be authors who don’t — but I’ve never met them. I’ve been doing this for a while now. I under­stand that revi­sions do not mean the work is garbage or terrible. I under­stand – prag­mat­i­cally speaking – that I have always revised, with edito­rial feed­back in hand. But the prag­matic under­standing did not stand up well to three novel revi­sions in a row. I’m never doing it again; I will take time to write actual book words – to create – in between. As it was, reading for the F&SF review column saved what remained of my sanity, because I had a book review column due, and had read only 2 books for it. I read, I wrote the column, and I sat down to new book words again. The Cast in Oblivion copy-edits arrived in my inbox. In the mean time, the gloom had the effect it always has: I avoid the internet. I avoid being on-line. I avoid being an author in public. Because I feel like a fraud; if I were the author that readers actu­ally wanted to interact with, I would never be this incom­pe­tent, right? The little voice that says, “but you’ve always worked this way since day one” is too quiet. The part of me that is Eeyore in real life? Is finally taking a nap. I have sent in the copy-edits for Cast in Oblivion (which is the stage after revi­sions and approval of same). I am looking at: three possible places to start the first of the End of Days books, and two possible places to start the Severn book (the begin­ning that’s there doesn’t quite work for a novel; it would have been fine in a short story), and my creative brain is now starting to be excited rather than cowering in embar­rass­ment. Hooray! Do we have an esti­mated release month/season for First­born? Or Oblivion? First­born: February 2019. Oblivion: January 2019 (which effec­tively is February in publishing terms). War: June 2019. Thank you for the updates! Are you satis­fied with the tpb reis­sues? It seems a bit odd they were just made bigger, without being re-typeset. @Joey: I am happy that they are in print. My mother finds them easier to read. I person­ally prefer the Sacred Hunt book — which I adored — because it was off-set and re-typeset, but: at least they’re in print >. I realize that this is “just not how it is done”, but, as an avid reader who *wants the story! *, I don’t under­stand why the publisher can’t take those 430k words and publish them as a two-book set for the finale; War, part 1 and War, part 2. That would certainly cut out a lot of work! I also realize that $ would factor in. I wouldn’t mind paying for a two-book set. Don’t you want to be a trend-setter? Haha. 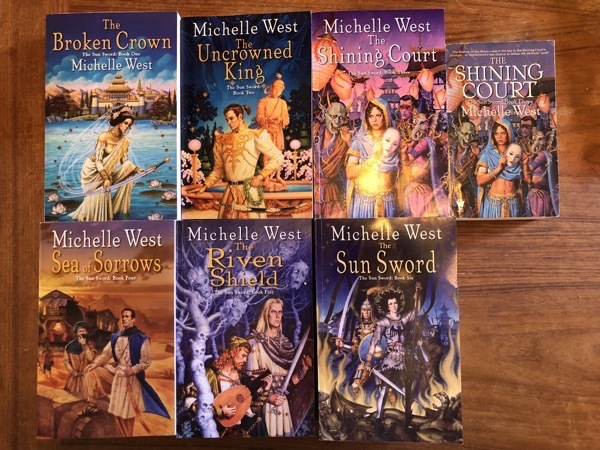 I love your stories so much that I have bought many many of your books to give to friends, and I am going online to Amazon to buy this *new* set of The Sun Sword … actu­ally, two; one for me and one for a friend who hasn’t read them and needs a happy surprise in her life right now. Arrgghh! I want a new bedtime story so I can stay up all night! You’re the best! Only human, please please keep writing! I eagerly antic­i­pate each new release! I’m glad Eeyore is napping, be proud of your creations. Under­stand the over­whelm, I can’t imagine revising three books at once. Thank you for sharing your creative writing with us, your read­er­ship. @Christine: It would work sort of. But readers will come into the series not actu­ally knowing that these two were published at the same time. Readers are used to writers who write series — but… half a book is still half a book, if that makes sense? And as a reader, I haven’t seen that “half a book” work well. People will get to the end of that actual volume and be unhappy with it as a book, on the very few occa­sions I’ve seen it done. So, this is effec­tively like that, but years from now if people are still reading these books, this one will work the way any other volume would. In theory. @Sally: we defi­nitely all have Eeyore moments. A friend illus­trated a children’s book — I’M SAD (Debbie Ridpath Ohi, Illus, Michael Ian Black, author) that I really *really* wish had been around when my own kids were young. Or hell, when I was. Wow; that’s a lot. Glad you’ve gotten through it and hope you’ll have some time to regroup and reflect on what is next. Love it all. @Anne: I’m an impa­tient writer; the hardest thing, pre-pub, for me to learn was to slow down and plan. Not outline, but — world-building, for instance. I wanted to jump right in and start right now. But… I think I’m constantly reflec­tive (about writing, I hasten to add); there’s a constant thread of Book Stuff going on, even when I’m not putting actual words on the page; it’s a kind of compul­sion. Wow! A lot of things going on for sure. Thank you again for every­thing and I cannot wait for all three “coming soon” novels as well as the two Severn novels (though, I confess, I’m not a huge fan of Severn…still excited for the books, but we’ve estab­lished I’m odd) and just every­thing else. Thanks for posting an update as well, they are always greatly appre­ci­ated! I hope all is going well for you other­wise, and I cannot believe it is October. This is all so exciting! I can’t even imagine trying to revise three books at once, I have yet to make it through one without an editor’s critiques without completely falling apart and putting it aside, usually forever. I cannot wait to devour your books! The begin­ning of 2019 is looking bright! I am so happy Sun Sword is reprinted and avail­able again. But please allow me to grumble a bit as I have Just managed to finish gath­ering all these together again from various 2nd hand sources online. I read these initially through the library and wanted copies of my own so I could start a Complete re-read to get prop­erly amped for the final (?) install­ment next year. (I know that House War is a ‘sepa­rate’ series tech­ni­cally, but Prac­ti­cally I consider Sun Sword and House War to be one series.) I so would have preferred supporting your writing more directly — but I will be nudging whoever I can in the direc­tion of what has become my favorite series of all time. Seri­ously. Move over Tolkien, Donaldson and Martin… I do wonder whether this has Some­thing to do with your autho­rial voice As a woman. I know those can be choppy waters, and even not partic­u­larly appre­ci­ated — such compar­isons only go so far and I imagine authors just want their writing to be appre­ci­ated on the merits Of it, and not ‘it’ as some sort of reflec­tion of their gender. Still. I have lots of ideas as to Why this might be so, but won’t venture to talk about them here unless others and you are inter­ested in talking about this notion. Also because here is a place where we can just express our support and contin­uing appre­ci­a­tion of You and your writing efforts — however tangled and mired in prob­lems ‘of your own making’. Just know that this reader recog­nizes the way you manage to take these sort of situ­a­tions, from the ‘real’ life we all live, and infuse your char­ac­ters and plots and dialogue with complexity, tension, humour, vibrancy, conflict, pathos and joy — all of which enable me to see and expe­ri­ence someone(s) Dealing with It all — the char­ac­ters on the page, and at a remove, You as a writer, plug­ging through all the road­blocks. Thanks for that. Oh so seri­ously and Joyfully, thank-you for all of it. I want to thank you so much for the books and stories you have created and gener­ously shared with your readers. I look forward to every one of your books and pre-buy them so I get them on their release dates. Getting lost in your stories and your engaging char­ac­ters is the best way to spend an after­noon. I hope you will continue to enjoy writing for years and years to come! So sorry about the re-writes; I can certainly relate as I dislike re-writing myself. I’m of the ‘do it right the first time’ mind myself and it irri­tates me to no end to have to redo just about anything lol! 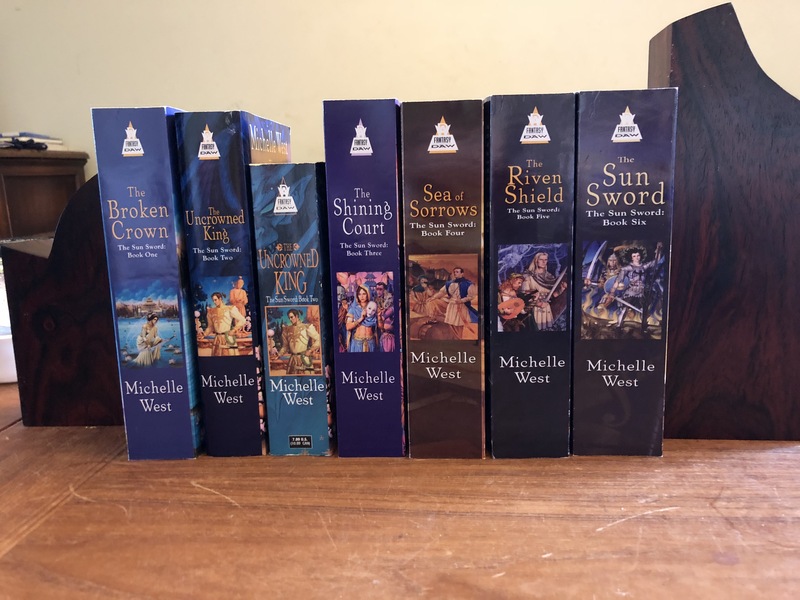 Please believe Michelle that your books are so well written that those darn re-writes must be worth it no matter how much they play havoc with your belief in your abil­i­ties. Those are mighty and we thank you! Big Hugs to you from a true fan! Will the Sunsword and Sacred Hunt series ever be finally put to audio­book?? I know for certain all of us fans would buy them imme­di­ately! You are my favorite author. Period…I would love to write even half as good as you. My own stuff tends to be ‘Kitchen Sink’ efforts lol. But any author I talk too has these panicky / Depres­sion / impostor doubts . I honestly think that expe­ri­encing these emotions allows us to write char­ac­ters so well, without all this feeling / conflict how could we portray it other­wise ? Just my 2cents..
Michelle, you can only do what you can. We fans are mostly ;) happy to wait. I know you wouldn’t want to put out anything but your best. Keep looking after your­self! Banzai! More books, no series ended = I’m a happy camper! I get more Eeyorish myself as time goes by. My newest avoid­ance tactic and beloved discovery is the K-Pop group SHINee. Also, that blog entry was much shorter than I expected. Heh. I find it odd that the cover for The Broken Crown does not align with the layout of the other 5 titles. Your name is top-lined and in a larger font on all but that book … seems unusual that they wouldn’t all be typeset the same way. Of course we would want to meet you and interact online. I think you are just a wee bit burnt out from all the revi­sions. Take some time for your­self, sounds like you need some. @Dede: First­born isn’t stand­alone — but it should read as if it were a novel in the series, as opposed to half a book, if that makes sense? @Estara: Another friend of mine is very inter­ested in K-pop as well :). @Jan-Michael: The audio­books that currently exist for anything else were picked up by Audible. The first 8 books haven’t been =/. From all accounts, it costs about 4k to put out an audio­book of “normal” length. so, my guess would be about 8k per book were I to get those rights back and do it myself and then upload it to Audio. (By do it myself, I mean: hire a narrator and book studio time). Well, except for HUNTER’S OATH, which is shorter. The bulk of the cost is paying the narrator per hour of reading time. I’ve been very lucky to be able to support myself with my writing — but, ummm, I would need to be rolling in money to be able to do this. Yes, in theory its an advance against future earn­ings — but… I don’t really have the up front money to do them myself. Which doesn’t mean it will never happen, but. @Tyke: Yes, I noticed that — but only after I lined them all up >..
@jo-ann: I think this is a conver­sa­tion for either in-person or another place. If someone told me that, if I wrote like Robert Jordan, I would be a million­aire, I would thank them (unless they demanded that I do it, in which case…), but I can’t write his books. I can’t write Sanderson’s books. I can only write mine. It’s not a ques­tion of quality; it’s not a ques­tion of good/bad, etc. If someone asks me for a story about Dragons, I can write a story about Dragons. But so can 20 other authors, and all takes will be different, if that makes sense? And I can spend the time thinking about how all the other authors sell hugely well, and I don’t sell *as* well — but some of this discus­sion presup­poses that somehow *if* people read the books they *would* love them; i.e. it’s only a visi­bility problem: If I were as visible as some of the male writers, I’d be just as popular. And I’m just not certain that’s correct in my partic­ular case. Reading, to me, is a little like falling inex­plic­ably in love. There’s a chem­istry to it that can’t easily be put into words (ironic, given that it’s the words that I fell in love with). But here, in this space, I try to talk to people who *have* found and *do* love the stories that I have in me to tell, if that makes sense? Hi Michelle, thanks for getting back to my ques­tion! So you mean that DAW DOES have the rights to produce the first 8 books? But if you wanted to produce them your­self, you would have to buy the rights back for each book? Well I will continue to keep my fingers crossed. Some old classic fantasy series by top authors like your­self (as I am sure you know) have FINALLY been put to audio…Ironically all DAW authors. So each week I keep checking to see if the Sun Sword series is there, LOL. I guess I just have to finally go back and begin rereading them again. Now that the trade paper­backs have come out, it has inspired me to reread them from the begin­ning again. I also thought that with the release of the trade paper­backs, that it might mean they were finally getting an audible treat­ment! @Jan Michael: DAW has the rights (90% sure on this, but those books were sold well before audio books were a thing), but the cost in my answer would not involve buying those rights back. The cost would be entirely in the *produc­tion* of the audio­books were I to do it myself. Well yea and hooray! First­born to look forward to; Cast in Oblivion to look forward to; War to look forward to. And in the future, End of Days series! But keep up the good work. I’ve been following you ever since the Hunter Oath duology came out. Adding re-reads and compar­a­tive re-reads (between the Hunter duology and the House War books) you have provided me with at the least WEEKS and most likely MONTHS of reading enjoy­ment. Thank You. So excited for the Severn novels! Been anxiously awaiting since I first heard this was in the works! Also, though all the recent ‘writing work’ has obvi­ously been stressful, as a fan I (and most likely we) am/are *extremely* thankful that you slug your way through it. Your talent and dedi­ca­tion are appre­ci­ated so much! I hope you can remember this when stug­gles like this arise: we will always love the stories you give us. Terry Good­kind produced The First Confessor as an audio book only. He did it all out of pocket. The book when you remove some of his massive repet­i­tive­ness was pretty good for his series. My husband loves audio books and listens to them when ever he drives. Audio books allows people who have issues reading to enjoy stories they would not other­wise expe­ri­ence. It does require buyers, but audible has actu­ally been putting out adds on streaming websites to try to get more people. I person­ally love your books. It is a well written world that you flesh out a little more in each book. I do not know if you have heard of P.C. Hodgell. She wrote dark fantasy back in the 1980’s with a female story lead before it was a popular thing. She is still writing her series and has been off an on for the last 30 years. Like you people love her work, but she is not as popular as she could/should be. Both of you have a lot of simi­lar­i­ties. Like you she also talks with people who read her books. This is one of the things I really like about you as well. It is not easy to write a world into being. We the fans point out any flaw. It can be good and bad depending on the story. I will be very honest, I rarely ever see an adver­tis­ment for any novels outside of a book­store. I love fantasy and first bought Cast in Shadow at Borders book store. I am glad that you made the series and that it has done well enough that they are buying more. We the readers have faith that you will do your best even when you ques­tion your­self a hundred times about the story you are working on. Try to remember that fact when you are over­whelmed. Thank you for allowing all of us to be part of your journey. Thank you for all your hard work! Can’t imagine revising 3 books at the same time! Although you may think that you are an Eeyore, I really enjoyed reading your books! Can’t wait to see the next 3 in print and a series with Severn? Wow! You always do such a fabu­lous job. Have read and re-read your books, espe­cially the Cast in… series with Kaylin. You are a wonderful writer! Thank you again for being willing to share your stories with us. Hi Michelle! A friend put me on to your Chron­i­cles of Elantra series last year and I’ve been hooked ever since! I’ve read them all, and I can’t wait to read the newest one. I do have one ques­tion though. Will we ever see Kaylin becoming more comfort­able (friends) with Night­shade? Hey Michelle! I so appre­ciate all of your hard, fantastic work that you do to bring us these amazing stories year after year. As soon as I read that we are getting First­born, War & Cast in Oblivion in the same year.…I jumped up and yelled, “Yes”, LOL. My hubby looked at me crazy, but when I told him why I yelled, he under­stood. He said, “Oh, OK, you love her books”. I absolutely love your stories. I catch myself thinking about Jewel, Meral­lone (sp? ), Kaylin, & even some newer char­ac­ters like Andre, etc. at odd points. That makes me go back and reread what­ever book(s) have the situ­a­tions I was thinking about. 2019 will be the bomb! 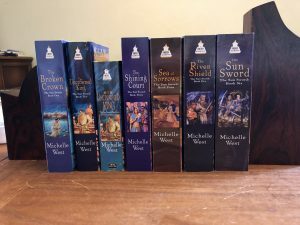 I was wondering if you ever thought to pitch or have been pitched by a streaming service (Netflix, Hulu, or Amazon) to make the entire world of Sun Sword & corre­sponding books, into a series. Your world, char­ac­ters, story arcs are so strong, well defined, magical, that it would make a great visual show. Would you be open to some­thing like that? Anyway, please keep on keeping on w/creating these master­pieces. If you ever feel like a fraud, please just come on here to see that we fans do not think you are a fraud & that we are waiting with bated breath for your next creation! KEEP ON WRITING!!! Your stories are so good, just hearing the dates for new releases get me excited. Hearing about your revising, remind of having to grade papers because grades are due. ???? @Peter: I have not given up on Roth­fuss finishing :). I loved the first two, but… his process makes it harder to finish. Every revi­sion of his – and this is me inter­preting what he’s said – is like *my* revi­sion of First­born. If every revi­sion of every West novel were actu­ally like that… I’m not sure there would *be* more than 3 books. Yes, I have thrown out a West novel from page one and started it again. Yes, I’ve had to add hundreds of pages in the revi­sion stage before (every­thing in Broken Crown prior to the assas­si­na­tion, not including the prologue). So it’s not a cut-and-dried process thing — but his iter­a­tions change a lot of the (unpub­lished) book. Hmmm. If I were Pat Roth­fuss, I’d be throwing out entire books from page one over and over again. I don’t think he has to do *that*, because his process is not my process — but if his process were more like mine, he’d’ve written 10 novels by now, by word­count alone (this is a guess, but I’m fairly confi­dent in it). The amount of writing he does on the single published book is prob­ably millions of words. It’s like, hmmm. Touch was prob­ably about 450k words worth of writing for that single book, which was certainly not 450k words when published. Grave was the same. You could say I wrote a million of words of fiction between the 2 books, only a quarter of which was actu­ally publish­able, in the end. But… the million words still took writing time. It’s not that I wasn’t writing; it’s that what I was writing wasn’t, in the end, right. So, I have faith that we’ll get the last of the Kingkiller books :). But I also don’t think the last of the three *is* the last book in that universe. @Stefani: I do under­stand why audio­books are popular; I have a friend who used to read, but now does all his reading on long work drives. I have a friend who listens to audio­books when she’s knit­ting or cleaning or cooking — it’s a way of getting to the words that don’t require use of your hands or use of your eyes (i.e. driving). I have never bought a book based on adver­tise­ment. I *have* bought books based on reviews and on the recom­men­da­tion of people with whom I have over­lap­ping reading tastes — but… never from an ad. So on some visceral *reader* level, I never quite feel that ads work. This is prob­ably wrong; I’m sure they can — but … they don’t work for me as a reader, so I don’t sweat their absence as a writer. @Marilynne: Thank you :). The Severn books aren’t an open-ended series, because they’re early Severn; his entry into the Wolves. And his weapon. (Which is the intent, at any rate >.>. I wanted to write a Shadow Wolf book, but my first attempt was Cast in Peril/Sorrow, which were, in the end, Teela books). @Rhea: a) Thank your friend for me! and b) yes, I think so. I’m not really good at romance, sadly, but friend­ships, I kind of under­stand :). @Talisha: I have one or two friends who have gone on to sell series to TV, and who have even written scripts for those shows. But they didn’t pitch the series, as far as I know. I wouldn’t say No out of hand if someone else wanted to do this. I think. There was someone who was inter­ested in the CAST novels, but they contacted me *before* they’d finished the first book, and I told my agent, there’s no way they’ll pursue this. Why? Because of what Severn did in order to save Kaylin. They couldn’t film it and make it work for a larger tele­vi­sion audi­ence, imho. A West reader who kind of disliked CAST IN SHADOW said that the only thing she really liked was that when the trau­matic events of the past were finally revealed, they *were* trau­ma­tizing. They weren’t simply a misun­der­standing. But I don’t think that it would have that effect. Struc­turally it would have to be like end of season reveal, and even then – it would be a very hard sell. I don’t think you could film the Cast novels. I mean, besides me, who would you get to play the Barrani? Thank you for the updates Michelle. I am so excited for the new cast book and to have Severn pov books! About the 432k words…since there’s no phys­ical binding for an elec­tronic book, It would be awesome if they (the powers that be) provided the option for readers to purchase the larger book as an e-book ONLY. I’d defi­nitely buy it. While I know this is wishful thinking, I must say that I truly miss the days of the 1,000+ page book! Anything less than 300 pages is a novella – at least, in the world according to Natasha. :-) I know I’m going on and on. However, it would be awesome to have a book that I could read that lasted a week or more. I work full time, go to school part time (master’s degree), am a mother of 3 boys (plus, Lucky – our puppy), and I’m a wife – but I read instead of watching TV – most days. Thus, having a book that lasts more than 2 – 3 days would be like Christmas everyday – or at least a week or so. Anywho…I can’t wait for “Cast in Oblivion,” “First­born,” and “War” to be avail­able. I’ll read them much too quickly, and be depressed for a day knowing I’ll have to wait another year for the next book. However, to tide me over, I will purchase The Sun Sword series for myself and for my sister (Christmas present). I’ve read the series twice, and will prob­ably re-read the House War series in prepa­ra­tion for First­born and War. I’m nearing the end of Sun Sword (76,2% in at the moment). I read House War 1 — 3 and Sacred Hunt 1 – 2 before starting the Sun Sword series. Really like the series. Anyway, I really like long epic series like this and I’d be inter­ested in knowing if you have any length esti­ma­tions for The End of Days? Closer to Sacred Hunt or Sun Sword? @Esa: Closer to Sun Sword. I think I can get it down to 4 very long books if I cut a few things from possibly making it onto the page. But… closer to Sun Sword. @Natasha: I read instead of watching TV as well :D.
But I always believe, when I start a book, that *this one* will be short T_T. Except for WAR. I love reading your books. You have a wonderful talent that brings you right into the story, like you are right there. The hardest thing is the wait. 12 months to wait to finish the book in a day. Thought they most defi­nitely are the type of book you can reed time and time again. They happen to be the most read books in my library. Thank you, I look forward to reading your next creations. Currently 66,1% into Skir­mish. One of my favorites so far. Anyway, was there a conscious shift in writing style between Sun Sword and Hidden City? It’s been a while since I began reading Hidden City (203 days to be exact (Yes, I keep a list)), but I seem to remember the writing in it being closer to what it is now in Skir­mish than what it was in Sun Sword. The writing in the House War books seems somehow more inti­mate or char­acter centered (And more funny too). Don’t really know how to describe the differ­ence, but anyway, the writing in HW is seri­ously some of the best I’ve ever read, possibly even the best. So yeah, kind of a long post. Just wanted to tell you that I’m happy that End of Days will be a long series instead of a short one and that I’m really liking both the writing and the actual content of Skir­mish. Hi Michelle! I’m really looking forward to Cast in Oblivion and am excited to read here that you’ll be telling Severn’s story! I’ve loved the Elantra series for your world-building, char­ac­ters who make me laugh — and cry — out loud, and creative story­lines. (My friends always know when I’m re-reading a Kaylin novel, as I’ll often laugh aloud without any expla­na­tion). The audible versions are my go-to stories for when I’m driving or working on some­thing else that requires hands and visual atten­tion; the chosen narrator does a wonderful job with the char­ac­ters. Unfor­tu­nately, though, the last few books have been harder to read. They’re missing a dimen­sion found in the earlier novels, which is evident in pace and story devel­op­ment as well as in dialogue and char­acter devel­op­ment. There have even been entire segments in the last few books that I’ve had to read multiple times just to figure out who is actu­ally “speaking”. I can’t imagine doing the many rounds of revi­sions you describe above; it sounds exhausting and disheart­ening! But editors who love the story and under­stand your process can make a real differ­ence in the end results. In a much earlier update you mentioned that your editor was suddenly no longer avail­able and that you needed to choose another. If there is any way that Mary Therese Hussey can work with you again — even in a freelance/consulting role — I encourage you to pursue the possi­bility! When you worked together, your stories had more depth, direc­tion and intan­gible quality that’s hard to define. I still love your stories and your char­ac­ters — they’re still funny and conflicted and quirky. It would just be fun to see the sparkle again. I would like to thank you for the amazing stories you have written. I was reading a book on Kobo and before I finished it I looked at the recom­mended books. I read a bit about a book and it said some­thing about people that lived under­ground and we’re shunned by society. I thought, neat I’ll check that out after. So after I finished the book I went back to recom­mend and saw The Hidden City and thought that was the book I read about before and instantly bought it, I didn’t even read the synopsis. Turns out it was one of the best mistakes I’ve made. A chapter in I real­ized I made the mistake but continued to read untill I couldn’t stop. I ended up reading them a bit out of order, House War novels, Sun Sword, then finally Hunters Oath. After all of that I was craving more of your work and have inhaled the Elantra novels. Loving it all and patiently waiting for the next. Hey Michelle, will the last two House Wars books be on Audible? Hi, Michelle! I hope you can tell that you, and your months of revi­sions, are SO appre­ci­ated. I’m also impressed at your thoughtful responses to so many of the comments above. I’ve enjoyed reading both your orig­inal post and the ongoing conver­sa­tion that follows from it! I’m so excited for Oblivion — when­ever a new Elantra book comes out, I tend to re-read all previous books in the series, so I guess it’s about time for me to start that again! Thanks for all your hard work! You can now pre-order WAR at Amazon (I did) for June 2019 delivery. “..War (House War Book 7) will be auto-deliv­ered wire­lessly to your Kindle on June 11, 2019.…”. @Robert: Yes, both books will be coming out from Audible (Or at least I’ve signed contracts to Audible to that effect >.>). I don’t know when, though =/. @Taylor: thank you! That is also kind of funny — the buying it assuming it was an entirely different book. Are you – or is Kobo – thinking of ABOVE, maybe, by Leah Bobet? (Which is excel­lent, but which is not really Hidden City). Michelle, I can under­standing having to much to do and not enough time to do it, and it all getting muddled. I am sorry for it. Take care of your­self, be kind to your­self, you are an amazing writer, I love all your stories which I have. I hope now none of the stories end. As much as I love them and want them all, I can wait. Your books are so worth the wait. I just real­ized that I have missed a bunch of your posts. So excited!! Severn’s short story has grown into 2 novels!!! Yay!!!! Thank you. I’d apol­o­gize for causing you more work… but I can’t truly be sorry that you are writing more about Elantra. Counting the days ’til Oblivion.